A clearly distraught and perhaps traumatized Anthony Pettis was reportedly seen with a fresh black eye during his latest exclusive interview. Blocking out the rest of the world with slick UFC endorsed Monster Octagon headphones Pettis talks with man on the scene Andru Edwards about his headphones, his upcoming title defense, more about his headphones, training with CM Punk, and lastly how much he loves his headphones. Pettis is scheduled to defend is UFC 1555 pound title versus Brazilian Rafael dos Anjos (?) at UFC 185 on Saturday March 14th. To prep for his next Octagon appearance, Pettis didn’t just listen to motivational music on his brand new headphones he also brought in “The Best in the World” to help in his training camp. The self-proclaimed “BITW” in the sport of pro wrestling, CM Punk has proven to be a welcomed edition to Roufus Sport as well as Team Pettis. With Punk in the fold rumors are black eyes have gone up nearly 1,000 % since The Second City Saint started working towards his UFC debut. 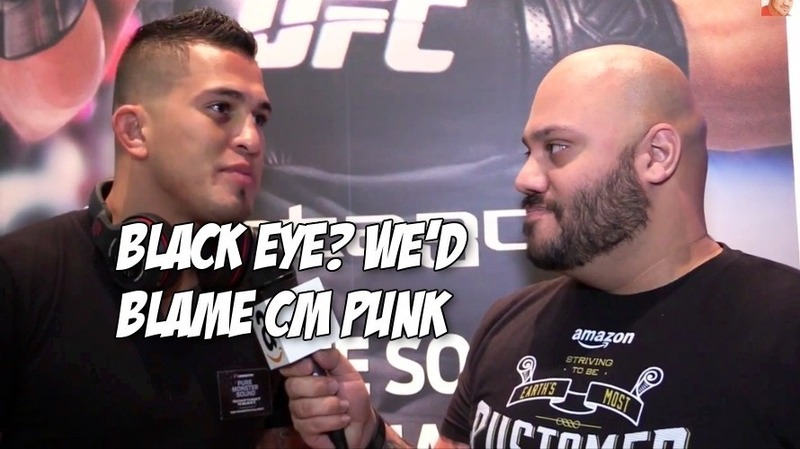 Overcoming a black eye from a possible Pepsi Plunge or GTS at the hands of Punk, Pettis will have to work through this debilitating injury while he game plans for dos Anjos. In the next week six weeks hopefully someone from Roufus Sport will have the heart to tell Punk that a diving double underhook facebuster and or a fireman’s carry dropped into a knee lift are both extremely dangerous for your MMA training partners and probably will not work inside the confines of the world famous Octagon.